Monday, June 18th, 2012 . What was that other guy’s name in the call? When did you talk last? Who else was there? Forget trying to remember all these things. Connect Evernote to ÜberConference, and automatically save call summaries in Evernote of every ÜberConference call you have. Each note has a helpful snapshot of the call information, a link to recordings, photos of the people in the call, and a few fun things like stats on the people that talked the most and the least. See how it works in this video. Evernote makes it simple to remember important details from anywhere, and it works across a wide range of desktop clients and mobile apps. Notes are automatically organized in their own ÜberConference folder, images are embedded in the notes so they load faster, and searching for a particular note by the name of the meeting or participants is a breeze. It’s been an exciting time since winning TechCrunch Disrupt, and we have been working on a bunch of new features. We are big fans of Evernote, and are glad to be announcing this integration as our first main release since launch along with a couple other new features –ÜberChat and Instant Conferences. We think the Evernote integration adds a great organizational feature for our users, especially for those that have to manage numerous conference calls. To get started, just go to your profile page and click the Evernote button to turn it on. We hope you like it! Tuesday, June 12th, 2012 . Have you ever been stuck on hold waiting for the organizer of a conference call to join? Wouldn’t it be nice if you could do something or communicate with others also waiting on the call to start? 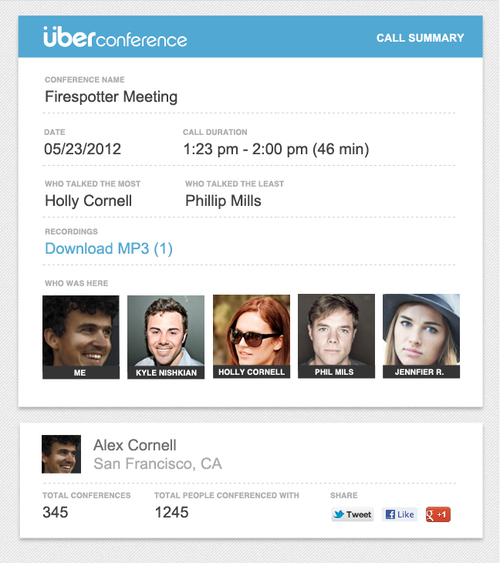 Fear not, as ÜberConference makes the waiting more bearable and even productive by our latest feature, ÜberChat. When viewing a call in ÜberConference, you can see who is going to be in the call and who is waiting before the conference starts. You can click around on user profiles to pass the time or learn more about the people on the call. And now you can send instant messages, like “Hey, when the heck is this call going to start?! ?” to others in the call that are viewing the conference online. Its also really helpful once the call starts as well, so now you can share links, paste in a simple agenda, or pose questions to the other people viewing the ÜberConference without interrupting the flow of the call. Currently ÜberChat is only available during the call, but we will soon have a way to view the chat record through the call summary. To access this feature while in anÜberConference, click the chat button along the bottom control panel.